Perfection on one of the most sought after streets in Westgate! 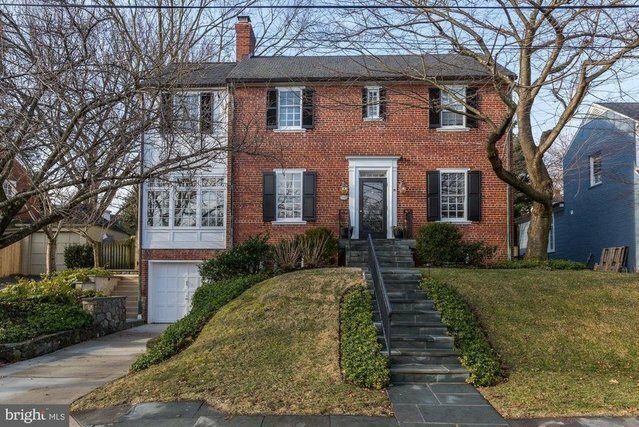 Conveniently located just blocks from the District line and three miles from Downtown Bethesda, this beautiful, fully updated Colonial offers the best of suburban life. The renowned community of Westgate is valued for its close-in location, proximity to dozens of shops, restaurants, public transportation, two parks, the Shops of both Friendship Heights and Spring Valley, Starbucks, Whole Foods, Westbrook Elementary School, and the Capital Crescent trail. Downtown Washington can be easily accessed via a short commute to Massachusetts Avenue or walk to the Metro.A gracious street presence and beautifully manicured grounds greet you upon arrival. The main level features a sun drenched living area, along with a four-season sun porch, dining room, and powder room. This level also includes a masterfully enlarged kitchen with Cathedral ceilings, beverage station, and walk in pantry with floor to ceiling shelving. The large kitchen windows overlook the vast rear yard and flagstone patio, perfect for entertaining. Upstairs is the renovated master bedroom complete with a custom closet and spacious renovated en suite bath, with its own laundry closet. Along with two additional bedrooms, each with custom closet, is a newly renovated hall bath. A fully-finished fourth floor features great recreation space or a potential fifth bedroom. Downstairs boasts a beautifully renovated bonus room/playroom complete with a built-in entertainment center and a fourth bedroom, separate entrance and full en-suite bath. A one car garage that includes built-in shelves for extra storage is accessible via the conveniently located mudroom.